After seemingly running out of space for ads in its newsfeed, social-media giant Facebook is now in the process of trialling autoplaying video ads in its popular messaging platform, Facebook Messenger. Alongside chats in your inbox from your friends, family members, and people-you-met-that-one-time, you’ll now be watching video commercials – a form of advertising that nets Facebook much more money than regular static ads. According to the social network's first quarter earnings for 2018, advertising was responsible for bringing in 98.6% of the company’s total revenue, accounting for $11.8 billion in the first three months of the year. 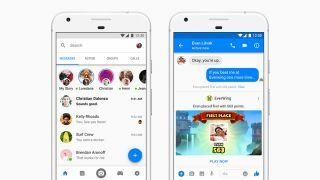 The trial for the feature commenced on Monday, June 18, but as Stefanos Loukakos, Messenger’s head of advertising, told Recode, the company will be monitoring user response to the new format to determine whether it will stick around. “We don’t know yet,” he said when asked about how a wider rollout. “However, signs until now, when we tested basic [static] ads, didn’t show any changes with how people used the platform.” These static ads have been displaying inside Messenger for 18 months. For those not interested in integrated advertisements in their Messenger experience, you can try out Messenger Lite, or alternatively, one of the many other chat and messaging services that don't contain ads.